New York, NY, February 2, 2011 – Today Rupert Murdoch, Chairman and Chief Executive Officer of News Corporation, unveiled The Daily -- the industry's first national daily news publication created from the ground up for iPad. "New times demand new journalism," said Mr. Murdoch. "So we built The Daily completely from scratch -- on the most innovative device to come about in my time -- the iPad." "The magic of great newspapers -- and great blogs -- lies in their serendipity and surprise, and the touch of a good editor," continued Mr. Murdoch. "We're going to bring that magic to The Daily -- to inform people, to make them think, to help themengage in the great issues of the day. And as we continue to improve and evolve, we are going to use the best in new technology to push the boundaries of reporting." The Daily's unique mix of text, photography, audio, video, information graphics, touch interactivity and real-time data and social feeds provides its editors with the ability to decide not only which stories are most important -- but also the best format to deliver these stories to their readers. "News Corp. is redefining the news experience with The Daily," says Steve Jobs, Apple's CEO. "We think it is terrific and iPad users are really going to embrace it." Led by Editor-in-Chief Jesse Angelo and Publisher Greg Clayman, The Daily is the first application made available on the App Store as a subscription -- which will be billed directly to an iTunes account. And because this paperless paper requires no multi-million dollar presses or delivery trucks, it will be priced at just 99 cents a week (or $39.99 for an annual subscription). "The Daily launches at a moment when advances in technology are changing the job of the modern editor," says Mr. Angelo. "These advances are giving us new ways to tell stories. We intend to take advantage of all of them, and make The Daily the new voice for a new era." The Daily will feature Sudoku and crossword puzzles, localized weather reports, and a customizablesports package that captures news on the user's favorite teams. Subscribers will also be able to leave comments on Daily stories in either written or audio form -- as well as bookmark them in-app to read later. As readers move through The Daily's content, they will be helped by several highly intuitive navigation tools. And while The Daily lives on the iPad, most of its articles can be easily shared via Facebook, Twitter and email. 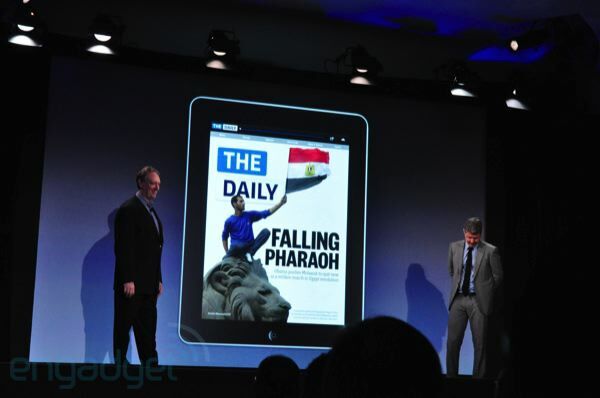 The Daily will link out to the web, as well as bring the web into the app. "In short, says Mr. Murdoch, "we believe The Daily will be the model for how stories are told and consumed in this digital age." The Daily is also changing the way advertising is offered and consumed within a news publication. Full-page ad units are completely interactive, customizable, and offer a rich mix of branding and direct response opportunities. Launch advertisers include HBO,Macy's, Paramount, Pepsi Max, Range Rover, Verizon, and Virgin Atlantic Airways. "With The Daily, Rupert Murdoch has given us the chance to rethink the entire experience of news delivery and consumption," said Mr. Clayman. "The ability to actively listen to and engage with our audience means we can continually provide an experiencethat consumers value in this fast-evolving tablet space. Together with our customers, our advertising partners, and the team at The Daily, we are excited to create a new form of media."